Recipe Copyright © 2001 Kasma Loha-unchit. See also: Kasma's informative Bitter Melon article. Cut the bitter melon in half lengthwise, remove the seeds and slice each half crosswise in thin pieces. Beat the eggs in a bowl with 1 to 2 tsp. of light soy sauce and a dash of ground white pepper. Heat a wok until its surface begins to smoke. Swirl in the oil or lard and let heat 10 to 15 seconds. Add the bitter melon and sauté in the oil for about one minute. Sprinkle with 1 tablespoon of light soy sauce and continue to sauté for another 1 to 2 minutes, or until the melon starts to soften. Spread the melon pieces thinly over the wok surface. Pour the beaten eggs evenly over the melon pieces. Let eggs set about half a minute, then flip the mixture over to cook the other side. Cook until eggs are set and lightly browned. Serves 4-6 with other dishes and rice family-style. Bitter melons are less bitter when they have fully ripened. A ripe melon will be light green in color with tinges of yellow or light orange on the outside. Inside, the spongy covering of the seeds would have turned from their light greenish white to a bright red. A less mature deeper green melon can be very bitter, but for people who have acquired a taste for the bitter flavor, it is a delicious bitterness. Bitter vegetables are known in the Orient to be very nutritious and medicinal and bitter melon perhaps leads the bunch for its medicinal properties. 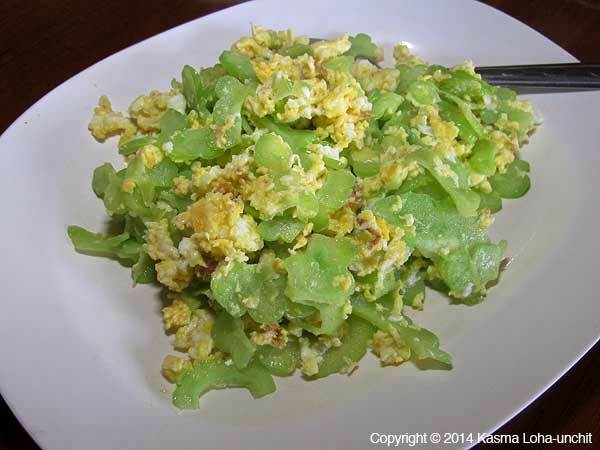 Note: Riper bitter melon is softer and cooks faster. Continue on to Kasma's Bitter Melon article. Also see her husband Michael's blog on Bitter Melon, Chorizo & Egg (recipe included). *Because the Thai language has its own script, there are different ways of transliterating Thai into English. The more phonetic version is Mara Pad Kai; the more usual spelling is Mara Pad Khai. See A Note on Thai Pronunciation and Spelling. Recipe Copyright © 2001 Kasma Loha-unchit. All rights reserved.